My latest "fix up". It's all cleaned up now... works splendidly as I recall from the day I first saw one in 1962. This receiver put ALL the others to shame when it came out. I'd checked out a fellow's Drake TR-4C (the radio, not the car), and when I got to the 2-B he'd asked to be checked out as well, I discovered it'd been dropped, which hung up the dial-drive and "captured" the pointer, among other things. The band switch was also appeared to have been knocked askew, which resulted in only having operation on 80m. Upon calling him to tell him his TR-4C & PS were done (replaced a .01 that had cracked and burned where the power connector is buried) and "prettified", I gave him the bad news about the receiver as far as my estimated time to repair - he elected to not put the money into it, so I traded him straight-across... the radio for my labor bill. Now, let me paint you a picture - it's about March of 1962, and I'm going to Navy Electronics Technician "A" school at Treasure Island, which sits in the middle of San Francisco bay. "T-I" as it's known to "the chosen ones", was the site of a pre-WW-II World's Fair (the ISLAND was BUILT for that purpose; attached to the end of Yerba Buena island), and later became a US Naval Station - it remained such until about the mid 80's, when it was closed down and "re-purposed". Dave Sublette K9IHG (now K4TO). NC-120 receiver, 'rescued' Heath AT-1 transmitter. Belonging to it presented some interesting benefits, as you stood your watches AT the ham shack, and were in a special barracks space, afforded ONLY for members of the club; yes, you had to keep your grades up to stay in it. It was there, that I got my Novice ticket... I'd wanted to get it for some time, but never thought I could pass the test, but with the help of a couple of much smarter (and slightly older) guys, I would sit in the back room and practice code on the weekends while studying. 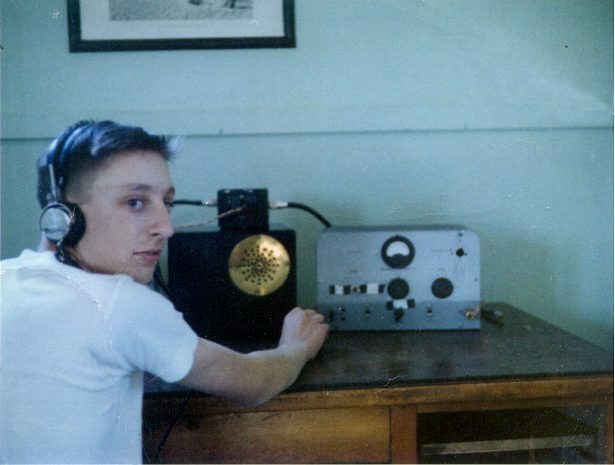 One of the guys who gave me the test, as any General class or above in those days, could administer a NOVICE exam, was Dave Sublette... Dave was K9IHG (Indiana's Happiest Guy) at the time [he's K4TO now], and he had a BRAND NEW Drake 2-B receiver. We were all amazed at it's performance. (the other guy was Bill Axelrod K3DDW, now K3WA) What with a product detector, variable passband, built-in filtering, a PTO (permeability tuned oscillator) which (unlike the variable capacitor tuning arrangements of the day, did NOT drift hardly at all), and triple-conversion. That setup meant that there were NO "images" to be found. What you heard was "really there". Now for you newer chaps, you don't have much problem with that these days, but in the "olden daze of yore", new Novices typically had things like Heath AR-3's, National NC-54's, Hallicrafters S-38's, surplus ARC-5 command radios and the like.. unless you'd cut a LOT of lawns, in which case you might have something better. All of those "entry level" radios were single conversion (one IF frequency), and image rejection was something you got with "better boxes". Anyway, the Drake was STABLE. Yep, it sat STILL! After very little warm-up, it would stay pretty much where you'd put it. A few diehards were still running AM, but most hams had moved up to "Donald Duck", "Slopbucket", or "Single Slideband" [sic], so you needed a receiver, where you didn't have to CHASE the signal's center. The Drake also had what other VERY EXPENSIVE receivers had, and that was a product detector; don't know what that is?... In the aforementioned 'olden daze', in order to copy CW and SSB on a receiver, you turned the BFO on, then turned the RF gain all the way DOWN, and the AF gain all the way UP. At that point, you used the RF gain as the volume control to avoid distortion and overloading, as this effectively killed the AGC/AVC action of the radio. Well, the product detector MIXES the BFO with the signal out of the IF strip, as opposed to INJECTING it; this means you keep your AGC/AVC action, and the radio provides about 2 "s" units of [effective] gain, over the previous method. Yep, all new receivers use PD's, except in the AM and FM modes. Meanwhile, back to the bench - I had to remove the outer case, which was held on by SEW* screws (*somebody else's & wrong), then remove the whole front panel, which fortunately, Drake had designed to come off without a lot of theatrics. Some bodywork on a corner, and then reforming the top (it'd been bowed down from the drop-impact) with the aid of a padded hammer, and a cloth-covered piece of oak (doesn't scratch the paint) was a trial, as it's got 3 pieces of metal welded together on the upper portion of the panel, AND a dial window to deal with as well - and that makes it tough to "unbend". Eventually, the sheet metal all assumed a darned close straight aspect and the tuning pointer for the slide-rule dial moved without hanging up (using some 600 grit sandpaper over the top of the backplate, upon which the pointer is pulled back-and-forth, makes things much smoother, by the way!). 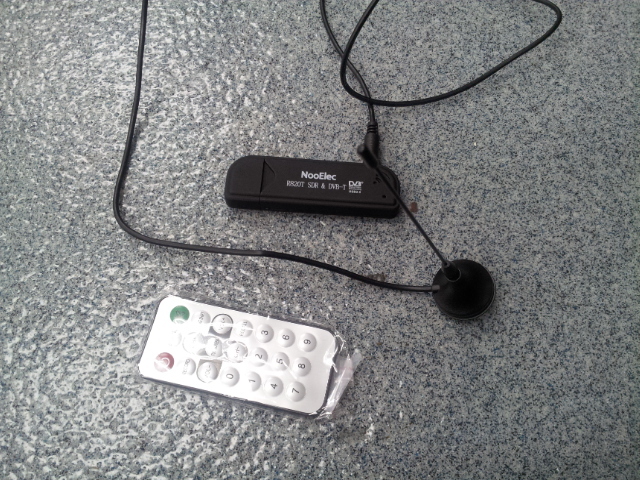 Then the bandswitch - hmmm, why doesn't it work on the other bands? Inspection revealed some oxidation on the rotary contacts; a couple of these had enough friction that they pulled the "squish contacts" out of alignment as the rotating contact went through them. Using a couple of scribes, and some mini hemostats (Kellys), I realigned each of the offending contacts until they mechanically operated correctly, THEN sprayed the wafers with DeOxIT (wonderful stuff - CAIG Labs). It came to life in a big way, but still had intermittant crackling and static, which was traced to the tube-sockets. Some investigation on the Internet reveals that MANY of the Drake tube-radios had problems with oxidized tube-socket connections - the cure (for me) is to clean the tube pins with a softer bronze-bristle brush (Harbor Fright), then wipe a thin film of CRAMOLIN (Caig Labs... but they don't make it anymore, so use DeOxIT) on the pins with my thumb and forefinger tips. Insert & remove the tube several times, and it will cure the problem - which it did. The sensitivity and selectivity is now right on the money 51 YEARS LATER! Finally, I got to wash the panel, knobs, and sliding-scale (it's how you set the calibration with the 100 kc xtal calibrator) which made them look NEW. A liberal application of "Simple Green" on a rag, cleaned somebody's cigarette smoke deposits off of everything; the tubes were washed with it as well. CAUTION: ONLY CLEAN ONE TUBE AT A TIME... MANY tubes have water-soluble markings, and if you don't remember which type it is, you will be presented with a handfull of very clean vacuum tubes, with NO MARKINGS to identify them! Most all of the GE types in this radio experienced this... the RCA's kept their markings! I still have to get the outer case repainted in the classic Drake Semi-Gloss Black, but operationally, it's terrific. 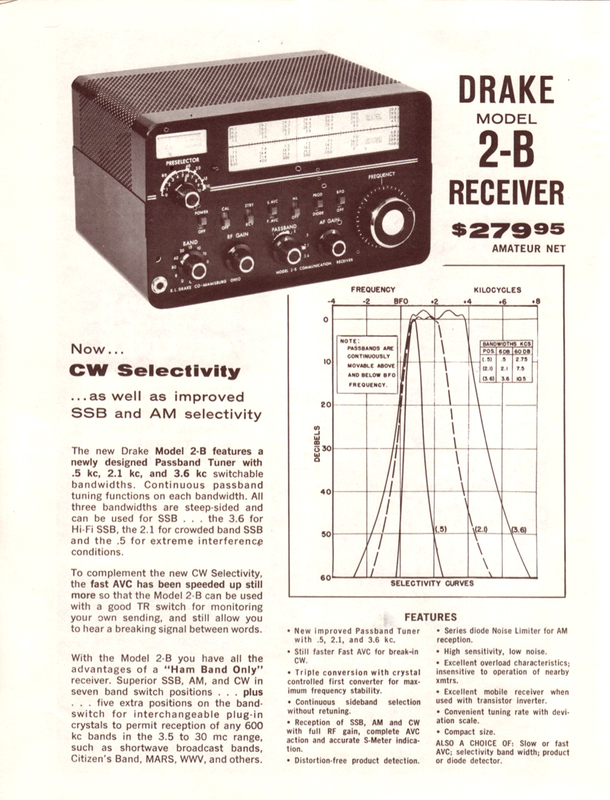 This receiver was a watershed moment in Ham Radio, as it incorporated advances in technology which were previously found only in Collins and military gear, and although it would receive AM, was expressly designed for CW and SSB use, also having the ability to add additional bands, simply by changing crystals. It was light, compact, and didn't outrage your electrical bill, and had 1 KC READOUT on the dial... direct! All that for $279 - a lot of money at the time, but a whole lot cheaper than a 75S1 Collins. After getting it done, I just had to Email Dave and tell him that after all those years, I finally had a Drake 2-B, just like HIS. Dave was my mentor at T-I, and with Bill, essentially opened the door for me in ham radio; he's a good friend and fine guy who just celebrated 50 years of marriage to his honey... Yes, he DID laugh about it, and chided "Wow, and it had 1kc resolution... right there on the dial!" Well after pulling a all-niter on the hardware side. 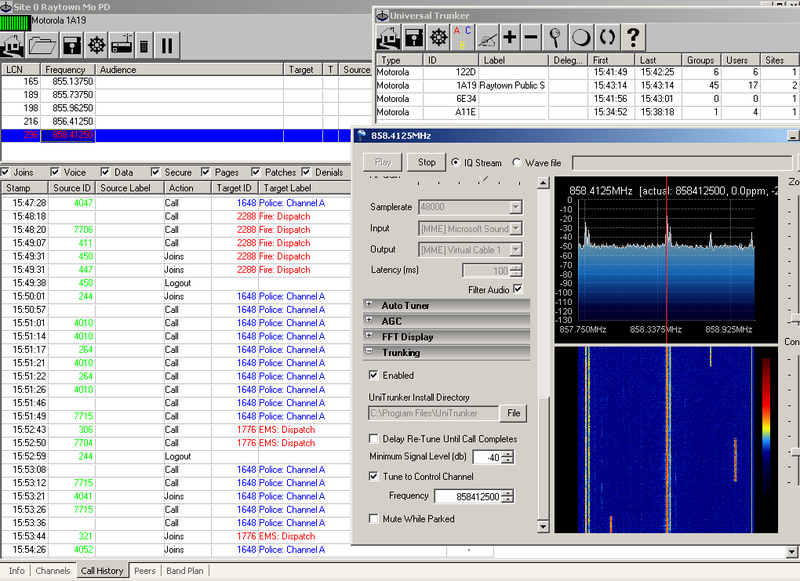 I believe finally I have all the bugs worked out of the control radio side of the P-25 SDR radio scanner. 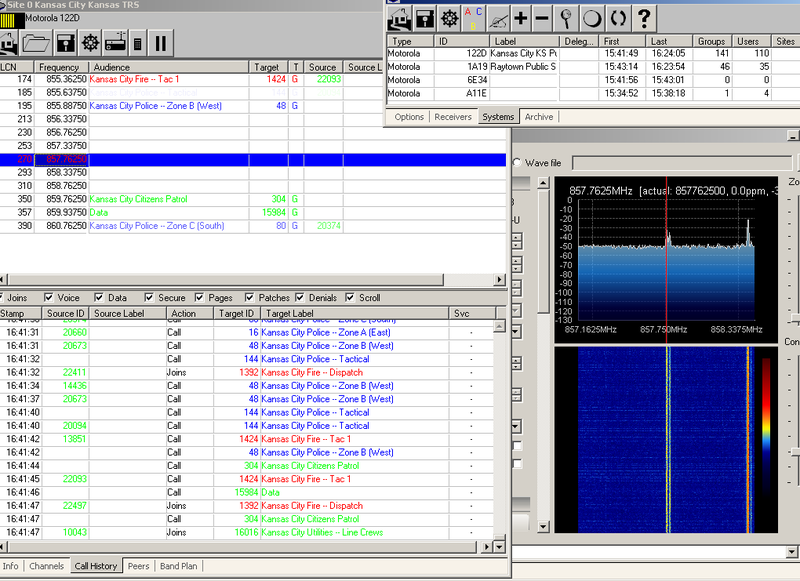 I at least now have proper decoding of the control channel from the SDR USB stick. Here is a screen capture of the decoded signal. for now proof of concept was done with the Raytown Public Safety TRS, as it is in my back-yard signal wise and a very stable one at that and has plenty of radio traffic to see things happening. Anyhow now to get the traffic radio going and following the signals of the control radio. For now I will concentrate on the analog TypeII trunked signal so I can work out the talk group following side of the scanning procedure. Then I will fire up the Cygwin and DSD "The Majic Sm0ke" decoder and see if we can follow some P-25 traffic using nothing more than a free windows PC box and some cheap SDR USB radios bought from a Canadian internet store. The "Hardware" SDR Stik is in lower center right corner. Still right now I only have about $60 in hardware invested in this thing. SDR Technology Has Arrived At Sm0kenet! 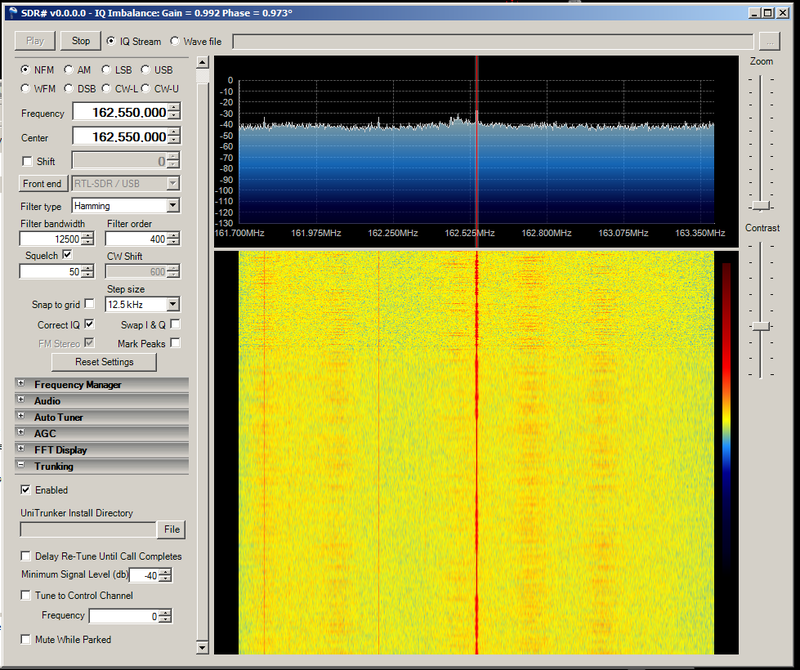 Well I have my first SDR P-25 Trunking/Scanning set up now. 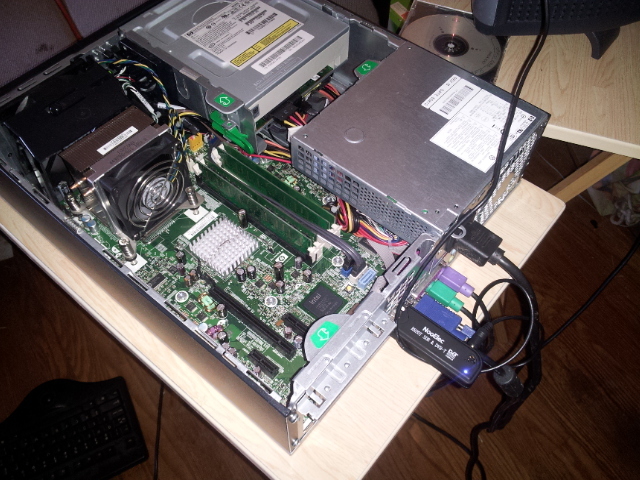 I will have to build up the PC hardware, which I have plenty of. doubt the rest of the project will work as written. It has a nice water fall display. & one for the traffic channel. Hopefully I can have a P-25 digital radio set up for under 100 Bucks! More as the project develops. 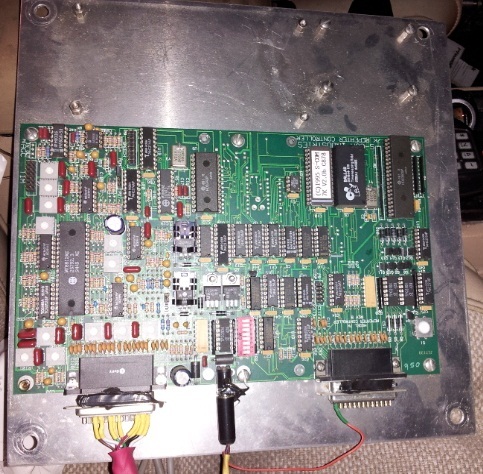 "New" Controller for 927.5875 - well not new, but recycled from a older BYRG repeater project! Well we now have a S-Comm 7K controller for 927.5875. I picked it up late Saturday night from Lucky (WØDRJ), he had pulled this gem from a old repeater project I scrapped out a few years ago when my former employer (CRC) moved out to Lenexa when the Cave at 31st & Mercier got vacated. I am glad Lucky salvaged this controller, otherwise the scrapper would have had it! I will have to fire this up and see if the "Dallas Clock Chip" needs replacing. It even has cabling installed and is basicly ready for interfacing to the Quantar repeater. but we will see when we fire it up on the bench. I saved this thing from the dumpster a few days ago. It used to be a Lucent DMXtend, and was probably 10k or more new! The chassis itself is not much different from what the repeater radios are mounted in at the Merriam site. It's a 2 RU rack mount chassis. I had to drill out about 2 dozen rivets, but I think that the result is worth it! Note that it already has 3 dual-speed fans installed, a terminal strip in the back, and plenty of holes for cable entry. I put a couple of Motos in it just for a mock-up. I may end up moving nodes 2211 and 2212 into this unit, or perhaps save it for another use at Merriam or elsewhere. Nice looking and functional rack mount box! All in all, I think it was a good re-purposing use of the chassis.